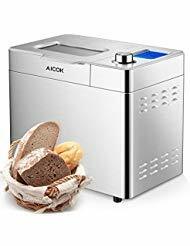 Save an extra 20% on Aicok 2 Pound Programmable Bread Maker Machine with Gluten Free Menu setting, 25 Programs, Large LED Display, One-Knob-Operation, Fruit&Nut Dispenser, FDA Certified, Fully Stainless Steel with this coupon code. This coupon code valid through April 11, 2019 or while supplies last on Amazon. Discount applies at checkout. 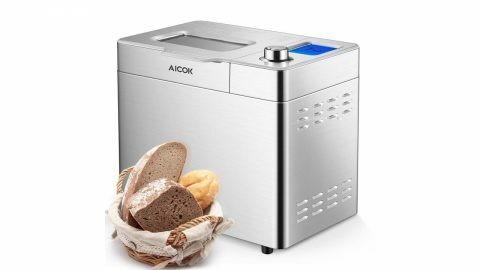  25 PROGRAMS INCLUDING GLUTEN-FREE: Programmable bread machine bakes bakes a large traditional rectangular shaped 2-pound loaf; Various healthy course settings include Multigrain, Whole Wheat, Rapid Whole Wheat, Gluten Free, Salt Free, Sugar Free and Vegan. ⏰ QUICK BAKING AND 13H TIMER DELAY: Quick baking cycle prepares breads in about 2-hour. And timer can be programmed to delay baking by up to 13 hours, in advance with 60 minutes of warm-keeping.  LARGE-SIZED LED DISPLAY: Large, easy-to-read LCD display with progress indicator visualizing all 25 kinds of menu, the process of bread-making and baking time. You can affirm the settings you've chosen via the LED display. Keep you effortless and informed all the way to a fragrant fluffy homemade bread.  FRUIT & NUT DISPENSER AND ACCESSORIES: Automatic fruit and nut dispenser releases ingredients at the right moment during the knead phase so they are evenly incorporated within the dough. Includes a measuring cup, measuring spoon, and recipes included. 燎 2 YEARS WARRANTY: The gluten free bread machine interior pan removes for easy cleaning in the dishwasher. FDA, ETL certification. Any problem please feel free to Contact us, We always strive to help resolve the problems.